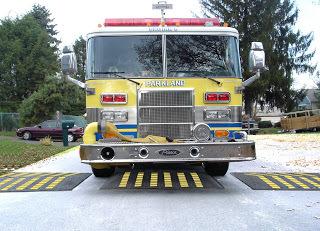 With the recent installation of our rubber speed cushions in Anaheim, CA, we thought it was a good time to explain why so many cities choose speed cushions (or as they are sometimes called, speed lumps) over the more traditional speed humps or speed tables. Speed cushions are basically constructed as a series of small speed humps installed across the road. With Traffic Logix interlocking units, you can even construct them to be more like small speed tables with flat tops. So what’s all the excitement about them? The main reason engineers like speed cushions so much is because unlike their full-road counterparts, they allow emergency vehicles such as fire trucks or ambulances to straddle them without affecting emergency response times. They are placed on the roadway at intervals that allow the width of such vehicles to drive over the cushions while ordinary vehicles have to slow down to drive over them. Another aspect of speed lumps that attracts cities is that they cost less than speed humps or tables because they require less material to construct. With rubber solutions which are charged per unit, this can equal a significant savings. The one drawback of speed cushions is that they can be difficult to construct of asphalt or concrete since each speed cushion needs to be exactly the same size for ease of driving and for driver acceptance. This can be avoided with rubber cushions, which are premolded and can ensure uniformity from cushion to cushion.